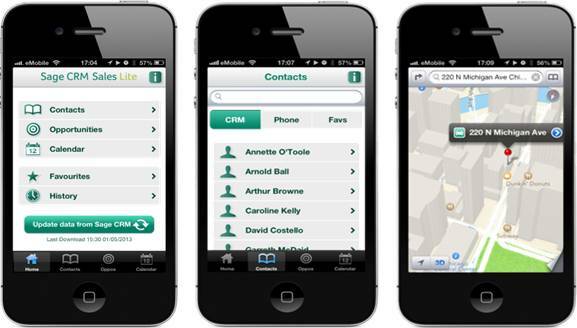 Sage recently announced the release of the Sage CRM Sales Lite App for iPhone. This handy app gives you offline access to your contacts and other CRM data on the go. It will also track communication you make through the app (call, text, and email) and update the Sage CRM database. Here's a closer look at this handy new functionality for Sage CRM. The Contacts menu option provides you with 3 tabs which display your CRM contacts, Phone contacts, and Favorites. When viewing a CRM Contact, you'll see all the fields and contact details that are available in the standard CRM summary screen. You can also view that person's history including opportunities, communication, cases, and notes. The app can optionally access your existing iPhone Contacts and allow you to add any of them as a CRM Contact with the click of a button. You can also add ANY contact to your list of Favorites - a shortcut to the people you contact most often. With CRM contacts right in your pocket, you can easily make a call or send an email or text message. The app will automatically save a record of the communication and allow you to add notes on the fly which write back to Sage CRM. Like Contacts, the Opportunities screen displays all the fields from the standard Opportunity Summary screen from CRM like lead source, forecast, order value, and other details. Using the iPhone search field, you can filter the list of opportunities that display and even add/update opportunity notes after a phone conversation or text/email exchange. The Sales Lite App for iPhone will also download your tasks and appointments for the next 14 days. From there, you can add alerts/notifications that will display on your iPhone 30 minutes before the start date. The notification will display both inside the app and in your iPhone notifications. Perhaps one of the most useful features of the app is the ability to work offline when you don't have a mobile connection or internet access. Just press the "Offline" button from the home screen and continue working with your contacts, opportunities, etc.. Any changes will be stored locally on your phone, and then synchronized to Sage CRM later when you press the "Go Online" button. The new Sales Lite App for iPhone is compatible with Sage CRM Version 7.2 or later. You'll also need your Sage CRM Administrator to install this component from the CRM Marketplace. Once these prerequisites are in place, you can click the Apple icon below and you can download the iPhone app which is available on the App Store.